ZINC New Haven LOVES cheese! We sample. research producers, both local and from around the world, a purchase some of the highest quality cheeses available. We are happily finding fantastic cheeses to share with you. Our cheese selections and our recently revamped cheese board by our resident Artist/Hostess are bringing smiles and tasty delights to everyone who has enjoyed them. Add your own cheese course to the beginning, middle, or end of any lunch or dinner at ZINC or enjoy is at the bar for a snack. 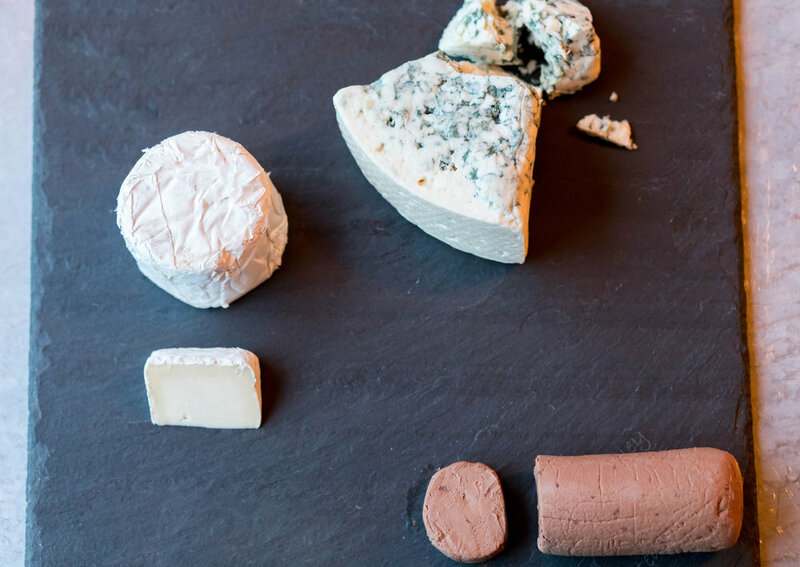 Here are a few of our favorite cheeses locally sourced. We offer imported cheeses as well, along with our house made chutney, local honey, and bread. In Marion, Massachusetts, about 50 Miles south of Boston, you’ll find Great Hill Dairy. Great Hill sources their milk from their local Guernsey cows. Guernsey cows are a breed of cattle used mostly in dairy farming. They are orange-red and white in color and are particularly renowned for a rich flavor of milk. The milk has a golden color from a high content of beta-carotene and vitamin A, which, by the way, has been known to help reduce the risks of certain cancers. The milk is high in butterfat and protein content, which make for some pretty delectable cheese. Great Hill Blue Cheese is an internally ripened variety made with raw, not homogenized milk, giving the cheese a smooth, full flavor. All the cheese is hand-filled using traditional techniques, which ensures proper whey expulsion and curd structure. The cheese is slightly off white or yellow since no bleach or other food coloring is added. Nettle Meadow produces what is the favorite cheese of 90% of our staff at ZINC. Kunik Triple Creme, made from goat and cow’s milk, has a white rind and a tangy, buttery flavor: you could eat this cheese with a spoon! I suppose you could use fruit or crackers with it too. Nettle Meadow Farm is a goat and sheep dairy and cheese company in Thurman, New York, a town in the Adirondacks between Gore Mountain/North Creek and Warrensburg. The farm was originally founded in 1990 and is currently owned and operated by Lorraine Lambiase and Sheila Flanagan, two avid animal lovers. They have more than 300goats, dozens of sheep and a variety of farm sanctuary animals-which basically means there is a place that you’re old animal can go to live out its days in peace. Here, at Nettle Meadow, they take in old and retired farm animals and some goats are available for adoption to have as pets or for brush goats. Sid Wainer & Son is a farm in Massachusettes that was founded in 1914 as a distributor that collected produce from the South Coast of New England and distributed it in push carts. They've grown a bit since then and have fine tuned their practices. They deliver fresh produce across the tri-state area the same day that it's harvested. Wainer & Son is a strong advocate of the Slow Food movement and sustainable agriculture. Many of the products it sells are grown on the company’s own Jansal Valley Farms, like their Chocolate Chevré Goat Cheese. They combine pasteurized unripened goat's milk cheese and imported dark chocolate to create the ultimate dessert cheese. This cheese is a suprising treat and a great choice for your dessert cheese plate! Next time you are at ZINC for lunch, dinner, or drinks at the bar, check out the cheese board and a 3 or 5 cheese plate for yourself or to share!